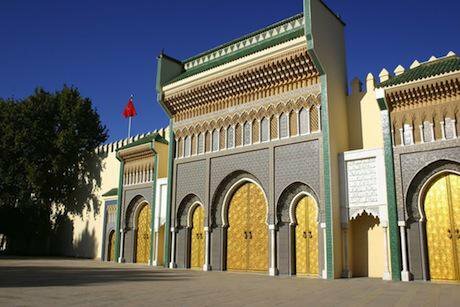 Royal palace, Fez. Bumihills/Shutterstock. All rights reserved. Judging by media stories and think tank reports, many foreign commentators seem unable—or unwilling—to see beyond the reformist image that the Moroccan leadership seeks to project abroad. This brief paper, based on half a year of research in the country, seeks to debunk seven common myths about Morocco’s supposed one-way journey towards ever-greater democracy. Some caveats up front: I have no intention of criticising Morocco, its rulers or its people. No foreigner could criticise Morocco as incisively, savagely and funnily as Moroccans themselves do. Also, I have no intention of lecturing Moroccans on freedom and democracy. I’ll leave that task to western diplomats: the French who preach freedom of expression abroad while cracking down on critical voices at home, the Americans who fly people to Morocco to have them tortured there one day and lecture the ‘Arab world’ about human rights, and the British who tirelessly fight corruption overseas while covering up corruption cases that involve their own elite. In discussing the seven myths below, I'm acutely aware that after only six months spent in Morocco, my understanding of this very complex and highly diverse country remains very limited. Readers are encouraged to add their own views in the comments section at the bottom of this article. Wrong. Morocco is not a constitutional monarchy. It’s a monarchy that has a written constitution. There is a separation of roles, but no separation of powers: political, economic and religious power are all concentrated in the royal palace, which takes all major decisions and effectively controls everything: parliament, the judiciary and security forces, and much of the media and non-governmental spheres. On the periphery, there’s a quite entertaining puppet show called the government, and a long-running comedy called parliament, with a medley of fractious political parties generating an endless variety of amusing but inconsequential plot lines. Every few years there’s an election during which the pack gets reshuffled and a few new jokers are turned face up to maintain an illusion of change. Wrong. True, the palace has instituted some very significant reforms since King Mohamed VI ascended the throne in 1999: infrastructure development, rural electrification, greater freedom of speech, and less torture in jails. But none of these are democratic reforms per se. In 2011, when protesters inspired by the Arab Spring took to the streets, the palace promised democratic reforms and presented a new constitution that is full of political freedoms—but then, so was the Stalin-era East German constitution. Paper is patient, as a German proverb puts it: you can write anything on it, and it won’t complain. The palace has been promising democracy since before independence. It’ll promise democratic reforms again in future. Nothing to get excited about. Wrong. As soon as the Arab Spring era streets protests lost momentum—partly due to savage police repression—democratisation was put into reverse gear. Democratisation in Morocco is a two-way street, and right now the country is moving backwards. To give just one example, the constitution enshrines access to information as a basic right of all citizens. The latest draft of the accompanying organic law adds a Kafkaesque twist: citizens have the right to access information, but if they then publish that information, they might get sent to jail for it. Thus the dance continues: one step forwards, one step back. Wrong. Moroccans have never been allowed to choose between these options, and nobody knows what the majority would choose in the unlikely event that people were ever consulted on the question. Also, the palace has prevented the emergence of any credible alternative to itself, evolutionary, revolutionary or otherwise. Only a quarter of adult Moroccans bothered to participate in the last electoral charade. If anything, Moroccans have collectively chosen political apathy over either evolution or revolution. Wrong. Many young Moroccans are unemployable under the conditions of global free-trade capitalism, and that won’t change any time soon. Most Moroccan school leavers and graduates are woefully ill equipped to occupy the high end of the global labour market due to the dismal public education system; the current palace-led overhaul of that system, if successful, will take a full generation to bear fruit. At the same time, Moroccan semi-skilled and unskilled labour is not competitive. Tragically, while the national minimum wage of about one Euro per hour is not enough for a family to live decently in a big Moroccan city, it is prohibitively expensive in a globalised world in which factory workers elsewhere get paid less than fifty Euros a month. Today’s challenge is not to create millions of jobs, which is impossible in the short term. The real challenge is to keep millions of angry young people from collectively venting their rage against a system that first neglected them and then left them to rot while the privately educated kids of the rich cornered all the desirable jobs. Wrong. Morocco may be less unstable than Algeria, Libya, Egypt or Mauritania, but that hardly makes it a stable country. Morocco is riven by multiple fissure lines: rich-poor, urban-rural, Arab-Berber, traditionalist-modernist, with a plethora of strong regional identities to boot. These pre-existing divisions could easily be deepened and exploited by unscrupulous political actors if the opportunity arises. The demonstrations that erupted all across the country during the Arab Spring ended in full-blown riots in many towns. In the near future, Morocco’s already tenuous social stability will be further strained by the growing number of unemployable young people (see above) and the devastating impacts of climate change. According to the World Bank, “[l]arge fractions of currently marginal rain-fed cropland are expected to be abandoned or transformed into grazing land; current grazing land, meanwhile, may become unsuitable for any agricultural activity". Picture the following scenario: A severe drought sends the economy into a tailspin, violent demonstrations erupt nationwide, and at that moment the royal plane crashes. What stability then? Wrong. The prime minister has repeatedly affirmed his government’s role is to implement royal directives. Political parties are narrow patronage pyramids that don’t even practise democracy internally. Business leaders seem unlikely to countenance large political risks against a background of long-term positive economic growth. Most citizens don’t vote within the system; most don’t actively demonstrate against the system. What do Moroccans want? No reliable polling data exists, it is impossible to tell. As for America and Europe, why risk democracy in Morocco if you can deal directly with a ‘reformist’ king who keeps imports up, Islamists down, and illegal immigrants out of Europe? To sum up: despite significant reforms on many fronts, Morocco is not moving towards more democracy, and seems unlikely to do so in the foreseeable future. Stability, already tenuous, will come under further strain due to unavoidable mass unemployability and the effects of climate change. Only one thing is certain: peering through the teleological lens of ‘democratisation’ will not help anyone to understand Morocco’s present or predict its future.